This "Historically Speaking" column was published in the Exeter News-Letter on Friday, December 5, 2014. “Here am I, a health new England Girl, quite well-behaved, bestowing just half of all my hours including Sundays, upon a company, for less than two cents an hour, and out of the other half of my time, I am obliged to wash, mend, read, reflect, go to church?? I repeat, what are we coming to?” So wrote a young woman who identified herself as ‘Octavia’ in an 1843 periodical called The Factory Girl, published in Exeter. There’s a stack of similar papers in the archives of the Exeter Historical Society, all testaments to the Exeter Manufacturing Company’s short-lived practice of hiring New England farm girls to work in the textile mill on the river. 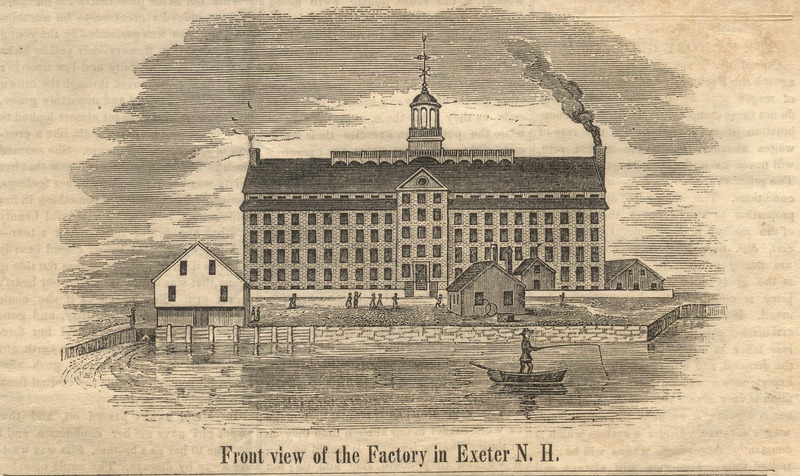 The Exeter Manufacturing Company began production in the 1830s. The Industrial Revolution was beginning to take hold of river towns and like the enormous mills in Lowell, Massachusetts; the original plan was to hire local girls to tend the machines. They could be paid cheaply and would live in boardinghouses owned and operated by the company. It seemed like a perfect system – the mill had a bright, energetic and totally controllable workforce and the girls could earn some money for a dowry. Rules for the girls were strict. Each worker was required to sign a ‘regulation paper,’ which laid out the rules and included restrictions for their off-hour lives. They were required to attend church, in some towns they were required to attend a specific church, usually the one the company owners attended, no matter what denomination the girls may have been. The work proved to be quite different from what the girls were used to on the farm. At home, working day may have been long, but at least the tasks varied. The factory required them to stand all day – often 15 or more hours – in an oppressively hot and dim room, the noise so loud it made conversation impossible. The weekly or bi-weekly newspapers that the girls assisted in producing helped keep their young minds from turning to mush with the daily grind. The earliest factory girl paper we have in our collections is called The Factory Girl and Ladies’ Garland, published in December of 1841. On the front page, just under the masthead, is an engraving of the Exeter Manufacturing Company. The scene in the picture is idyllic. The mill sits on the river, a cozy smoke stack seems inviting and a leisurely fisherman is seen standing in his dory in the waters of the Squamscott River. A table of statistics next to the image reveals that, “the number of females employed is 212, the number of males 40.” Wages ranged from $1.25 per week in the card-room to $3.50 in the dressing room, with the men making the high end of that range. Unlike the Lowell mills, however, there was no boarding house system run by the company. “The girls are not compelled to board in the houses belonging to the company, but are allowed the privilege of boarding wherever they please – within five minutes walk of the mill.” If the rates were similar to Lowell, each girl would have spent just under half of her weekly wages on room and board. The paper continues to brag, “there are but very few ever employed in the Mill under 16 years of age; and there is not any who are unable to read or write.” The literacy statistic is meant to compare the American system of wage labor to that of Great Britain, where it was already obvious by 1841 that factory work was done by the lowest class of people. In America, education was the element that raised people up from the gutter. The girls were encouraged to join lending libraries, attend free or low-cost educational salons, where the topics ranged from religion, current events, mesmerism or phrenology. How they managed to stay awake for these programs after working a 16 hour day is a mystery known only to teenagers. The system of hiring factory girls began to fade in Exeter by the 1850s. By that time, it was cheaper to hire whole immigrant families from Ireland and Canada. These new workers remained on the payroll far longer than the farm girls, and their children could be hired for pennies on the dollar. Image: The Exeter Manufacturing Company as depicted on the front page of Factory Girl and Ladies’ Garland, a periodical published in Exeter in December of 1841. Small newspapers such as this encouraged mill girls to read and endorsed ‘womanly’ virtues such as modesty, frugality and industry.